Pre Filter : 20 X 20 Micron PP Filter USA. Pre Filter :20 X 5 Micron PP Filter USA. Carbon Filter : 20Activated Carbon Block Filter-Taiwan. We are the leading suppliers and wholesalers of Commercial 25 LPH to our clients. 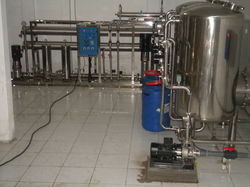 It is designed to deliver up to 25 liters of pure and hygienic drinking water per hour and is manufactured under technical supervision of the team of our company. Raw material used to manufacture this purifier is of superior quality that is being sourced from known and trusted dealers. We are providing Commercial RO Purifier with the capacity of 50 litre per hour reverse osmosis system. Raw Water Pump: To pressure feed raw water to the sediment filter and further treatment stages. Sediment Filter: Feed water will pass through the unit for removal of existing suspended impurities, by the action of media / bed provided into the unit. Vizpure Reverse Osmosis India Private Limited. We are engaged in providing Commercial & Industrial Reverse Osmosis that is a process by which hardness of water and TDS level is reduced. RO is a process by which water molecules are forced with the aid of 0.0001 micron semi-permeable membrane by pressure. The waste left by way of filtration process is drained out through pipe.available capacity is from 250 LPH to 10000 LPH plants.